First thing: Just went through the Mets spring training roster, and it's clear. 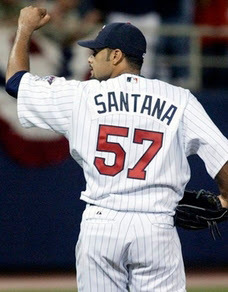 They need to get Johan Santana. More than the Yankees or Red Sox, they need to go out and make this happen. First off, they have an aging Pedro, who ain't getting any better, and anyway, can he last the season without tiring or breaking down? Then they have Orlando Hernandez, who, in Cuban Defector Years, is somewhere around 42 years old. Youngster Mike Pelfrey didn't set Shea Stadium ablaze with his 5.57 ERA in a pitcher's stadium. Is John Maine a no. 1? Oliver Perez is nice, but whom can the Mets rely on? No, the Mets, who stupidly traded Lastings Milledge for a fungo, need to go out and get Johan in Queens. "We don't feel like we have to deal for a pitcher," says GM Omar Minaya. Sorry, but I disagree. Just want to thank the MLB schedule-makers for not forcing the Yankees to travel to the west coast a whole bunch of different times like the did last year. (For god's sakes, package trips to Seattle, Oakland and Anaheim together!) Though they do force the Yanks to play a night game in KC on a Thursday right before they have to fly to Boston to play a big weekend series. Why not a nice day game, guys? Wow, Mark Tauscher really played well against Michael, "Alfred E. Newman-teeth" Strahan. I mean, Strahan only had 2 tackles and no sacks, and most of that was with Tauscher blocking him one-on-one. You gotta give credit to Charlie "Son of Tuna" Weis. After literally, the worst year in Irish football history, he is hauling in a sick recruiting class. He got the second best-rated passer in the land, the best tight end, and about a jillion other blue chip prospects. As of this writing, (and subject to last-minute changes before Signing Day on Feb 6th), Notre Dame has the second best recruiting class in the land—ahead of champions LSU, and the usual diploma factories, Florida State, Texas and USC, though USC usually does pull in a bunch of kids late. I have to say, I kinda dislike Serena Williams. So talented, so gifted, and she goes out and lays and egg in straight sets this week at the Australian Open. So what does she say? "I didn't move the way I traditionally want to move, and I wasn't feeling 100 percent." It's always something with her. This injury, that injury. She has athletic gifts most of us would kill for. But mostly, it looks like half the time she doesn't want to play. "Sluggish," "lethargic," were some of the words used to describe her play against an inferior opponent, who, by the way, had a bunch of her own injuries. 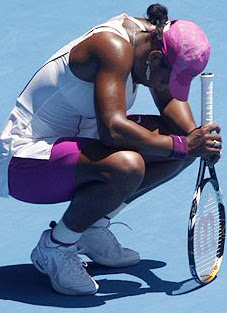 As two-time Grand Slam champion Tracy Austin said, "She was a mess. Her body language was down the whole day." I wouldn't be saying this if I didn't think Serena could be one of, if not, the best of all time. Serena. Stop with the fashion lines and photo shoots. Focus on the game God meant you to play. Dana Stubblefield this week admitted to using steroids. And by "admitting," I mean he got busted cold in the BALCO investigation. And to that I say, good riddance and go away forever, Dana. And lastly and for the last time, the Jets will not be taking Darren McFadden in next spring's draft. That's a guarantee. Right now, at my computer desk, I am doing the Joe Namath guarantee finger point. So enough of that. Great submission, P-Cat. All over the place...I love it. I have a new nickname for Serena Williams: Chocolate Bubblelicious. Her appearance conjures up that description. Plus, you can't take someone with a nickname like that seriously in professional tennis, which is appropriate for her - she doesn't take her tennis seriously either. Otherwise, she would rarely lose. As for the Jets, they need to go with the big impact defensive player or a can't lose offensive lineman. The Jets are in a tough spot, because Dorsey and Long look to be impact players and won't be there. The DT from USC, Sedrick Ellis, is small, like most USC lineman. Pete Carroll doesn't recruit size - speed, speed, speed is all he cares about. Maybe the Jets deal should deal this pick for additional picks. It's not a bad move. Johan Santana's ERA in Shea stadium would be microscopic. Omar needs to focus and make that happen. Hey. This is Steve from http://yankeesmtom.blogspot.com/. I got your comment and that sounds good. Your link is already up.